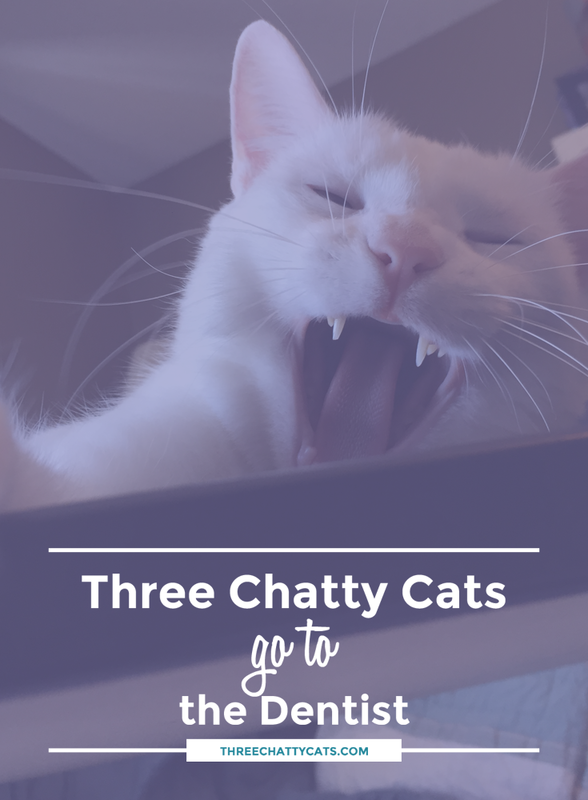 So, as we close out another February, I figured I should hop to and tell you about our recent dental experience with the cats. And stay tuned at the end of the post for a giveaway, thanks to Chewy.com. Being a cat mom for about six years now, I don’t often get a lot of “firsts” anymore. But I did have one recently. It was the first time I took all three of my cats in (at one time, mind you) for complete dental cleanings. Surprisingly, up until that point, we’d never been told to do it. But during a routine exam, they recommended it for Olive. And Sophie, well, she had developed some really bad breath. And just to cover our bases and since he’s the oldest of the three, we dragged Dexter along, too. Lucky boy. The vet requested that we drop off the kitties early so they’d have enough prep time. We arrived at their office around seven in the morning, and in we walked with three cats harmonizing quite nicely to the song of their people. Heads turned, smiles were given, and understanding nods from fellow cat owners were exchanged. The lady at the front desk gave us the rundown on the potential costs. After Ross, my hubby, and I started breathing again, we signed on the dotted line our agreement to pay. We then bade farewell to our miserable trio and headed home. The call came in the early afternoon. All three cats did well and were coming out of sedation. Dexter had tartar buildup on his upper right and left fourth premolars. He also had mild inflammation along the gumline of his upper left canine. But overall, no extractions were needed for Dexter. Yay! There’s nothing of import to note for Miss Sophie (besides the fact that the entire vet staff loves her). Sophie does have a tip fracture on her upper right canine. But she’s had it since we found her and it’s not causing an issue at this time. 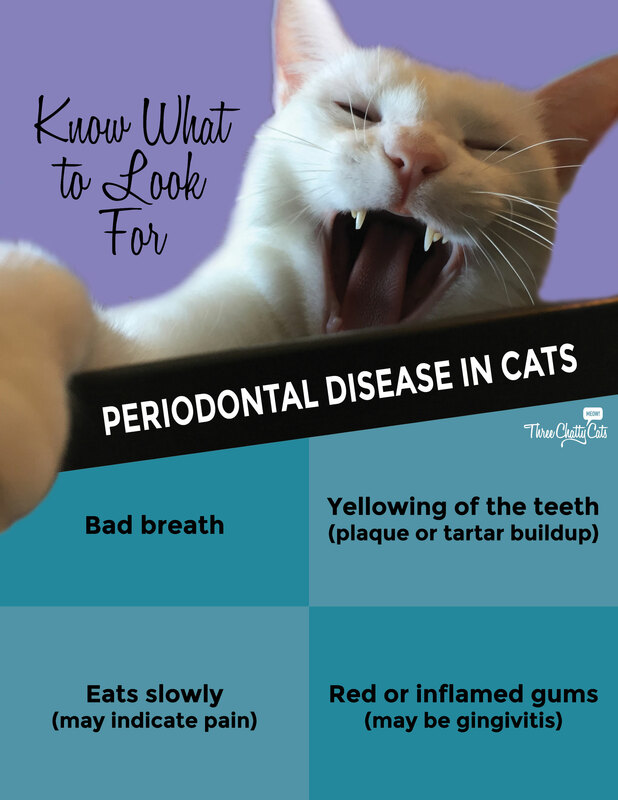 You can see the tipped tooth in the Periodontal Disease in Cats graphic below (click to enlarge). And then there’s Olive. Oh my, poor Olive. Before we brought her in, we’d been warned that she may need some extractions. Turns out Olive needed five extractions, including her two upper canines. (No more fangy grins for Miss Olive.) She also had both of her lower third premolars and her upper left second premolar extracted. So all in all, five teeth extracted! Olive clearly has periodontal disease. Before and after extraction shots are below. But I’m happy to report that Olive recovered just fine from her surgery and could care less about her missing teeth. 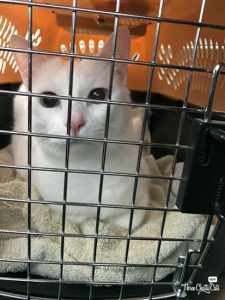 When we were finally able to rescue our kitties from the vet’s office later that afternoon, we were sent home with sample dental treats and also told about oral rinses and dental wipes. I’d heard of rinses before, but not wipes. And obviously, they recommend that we brush their teeth – daily! Or, at least 1-2 times a week. I’m sorry, but have they met our cats? We went the dental treat route for now and will also be looking at oral rinses. 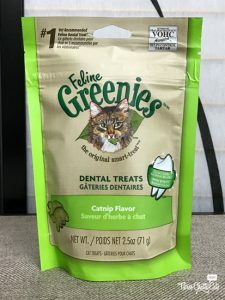 I was happy to see that one of the February offerings to try out this month for Chewy.com was Greenies Feline Dental Cat Treats. Since Olive was in most need of these, I let her pick the flavor. Naturally, she went with catnip flavor. According to the Chewy.com website description, Greenies Feline Dental Cat Treats “have a unique shape and crunchy texture that’s proven to reduce tartar.” That sounds good to me! Olive gobbled up these treats. Even with her few missing teeth, she did just fine. And over time, I hope they help her with future dental issues. You can currently purchase a 5.5 oz bag of Greenies Feline Dental Cat Treats from Chewy.com for $3.89. The treats are available in a variety of flavors. Remember, Chewy.com offers free shipping on orders over $49.00. And now, why not enter our giveaway to let your cat try out these dental cat treats! One lucky reader will win one package of Greenies Feline Dental Cat Treats, thanks to Chewy.com. Enter a blog comment below and then enter the giveaway. The giveaway is open to U.S. residents who reside in the 48 contiguous states, 18+ years of age, except where prohibited by law. One winner will be selected randomly by Rafflecopter and contacted via email. The winner will have 48 hours to claim their prize. Failure to do so will result in forfeiture of the prize, and a new winner will be randomly selected by Rafflecopter. The giveaway closes on Monday, March 6, 2017 at noon Pacific. What steps do you take to ensure dental health for your cats? Would love to win some greenies for my kitty! I did two cats last year. Yikes $$$. Both required extensive extractions. They are ages 13 and 11. Both were on pain meds for a few days. Both resumed eating like there is no tomorrow! Gone is the nasty breath! Poor, poor Olive!!!!!!! My Angel Bobo used to have a yearly cleaning.I remember the Vet telling me that teeth issues with cats were primarily genetic (just like they pretty much are with people). Cody doesn’t have any teeth issues (yet, knock on wood), but my Angel Bobo had to have those regular cleanings. Dakota LOVES the Greenies bones, Cody never tried the Greenies treats……….would enter, but you know why I am not (wink), good luck to all who enter!! How would you get a cat to use a dental rinses?!? I have dental wipes for the cats but sometimes I forget to use them, this is a good reminder to start that habit again! You add it to the water bowl they drink from. There’s a spray you can get, or you can get stuff that’s added to their water. Ah, so they don’t actually “rinse”. It’s more of a dental drink. I must check those Feline Greenies out! Glad to see all of you got taken care of and have great pearly whites once again. aww.. losing the canines are so hard. Purrs for a quick recovery. I’ve even taken my ferals in for dental cleanings, that’s how important I know that they are! Sweetie is missing 19 of her 30 teeth; poor baby, what a rough life she’s lived on the streets. Angel has a dental cleaning just over a year ago, and they extracted one tooth. Chucky cannot have dentals because of his bad heart, but I will discuss AGAIN with the vet on Thursday. 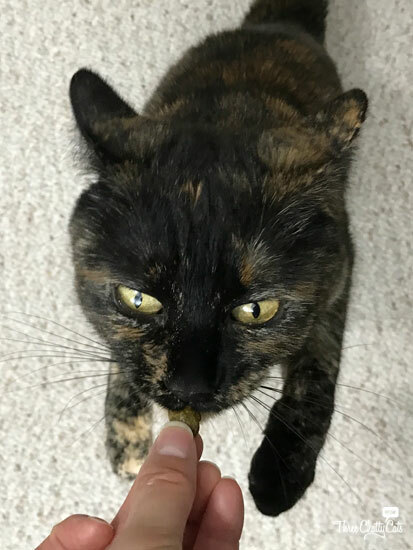 We have some Orajel that we give to the inside cats as a treat once in awhile, but never found a way to brush their teeth. I’ve heard a lot of cats don’t miss the teeth, because they feel so much better having them gone! 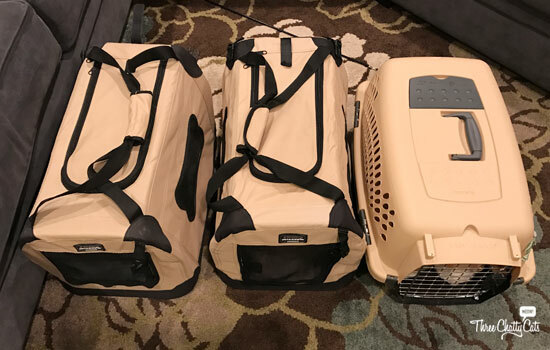 Hope your vet gave a discount for three cats at once! HA! Wow, three at once?!? That musta been a challenge! The mom has a hard time taking just one of us. ;) We’re glad to hear all went well…’cept poor Olive. We know how important dental health is, but we still won’t let the mom brush our teeth. I think Olive is gonna have to start biting you. That’s how I keep my teeth in good shape. Great giveaway. I love the catnip Greenies. I’ve lost count on how many teeth Bear’s lost. I first noticed the problem a couple weeks after I brought him inside, when I noticed blood on the toys we were playing tug of war with. I dismissed it because Bear wasn’t even a year old! Sure enough … a year later our vet looked at him and recommended cleaning and a few extractions. Some cats are just prone to issues. I’ve brushed his teeth every day for the past 9 years and he’s STILL lost teeth. Poor guy. The biggest problem with him is that he develops pockets under the teeth and unless he’s under anesthesia and the vet can really get in there to check, a simple visual examination won’t show any problems. I’ve been told how wonderful his teeth are because of the brushings only to have a tooth fall out on its own a few months later. Still, my best piece of advice is to make sure the vet examines your cat’s teeth at EVERY visit … no matter the age of the cat! So many skip that part. great post- i brush my trio’s teeth but last year I spent 1000!! on a cleaning and extractions for Amarula (your fellow tortie feels for you Olive!) she was a stray before i found her so who knows what she was eating! Glad your trio did well overall! Poor Olive- don’t worry, the Tooth Fairy will visit you soon with toys. I can only afford to do a few cats per year so we rotate, but I try to get them good dental care. Poor Dexter….dragged along because of his sisters. :) Poor Olive for her loss, but we bet she feels better. Three at once, you are very brave! Rosie will be having her first dental next month. She arrived with one only one upper front tooth. We call her the one-tooth wonder and occasionally pirate kitty. She often walks around with her remaining upper tooth hanging out – makes her look fierce. LOL. I am glad all three did so well. Sorry Olive had to have so many extractions. Hope you didn’t have to sell your house to pay for it. I almost passed out when I received the bill from Ruby’s dental last year. Oh, poor Olive. We’re glad she recovered nicely. Lexy had some tartar buildup at her last visit, but we’re keeping an eye on it. We love dental treats. Our Angel Sammy had perfect teeth – never had to even have a cleaning in his 17 years thanks to dental treats. He didn’t care for Greenies though even though we know zillions of cats who love them! Teddy is a different story – he LOVES the Greenies dental treats – we’ve only had Teddy two weeks but he’s eaten a whole bag of them and is ready for more. We hope his teeth will stay in good shape like his big Angel brother’s did…..we hope they do the trick for Olive and keep her from having more teeth out! Our vet told us that it was time to get Wilson’s teeth checked. The problem is that he has an on-and-off heart murmur that might be something. So they can’t do the dental work without checking his heart first because if the murmur is real, then they can sedate him for the dental work. If you stopped breathing when they told you the cost of the dental work, imagine how we felt when they told us the cost of a heart exam. Oh gosh, I can only imagine! Chewy’s is the best! We’re sorry to hear about Olive’s extractions, but hope the dental treats help everybody avoid more problems. All of you went in all at once? MOUSES! Peep #1 says she is VERY impressed. Most she ever does is two of us at once and even with just two, we give her grief. PURRS. My cat hasn’t had any dental issues and the vet has never told me he needed dental cleaning. I sometimes buy him dental treats to prevent dental issues and so far it seems to work. You and your husband are very brave to take in all 3 cats at one time! I’m glad they all came through the sedation and surgery OK. And I hope Olive won’t have any more problems. We’re thinking Natasha needs to have a cleaning–we can see tartar when she yawns or otherwise opens her mouth widely. Oh wow mew guys, that sounded like a helluva day, glad all went well though! We, aka The Hoard and I seem to have avoided any dental purroblems thus far, and paws crossed it stays that way. Aww! What a rough day for your babies! Never heard of dental rinses or wipes for cats, definitely going to look into these. I have a sphynx cat that has horrible breath. The dental treats do help and he’s gotta go back to the vet soon. This is great. My cat I know will love this. She is still fairly young but this will help her now. When she gets older she might still have all teeth. 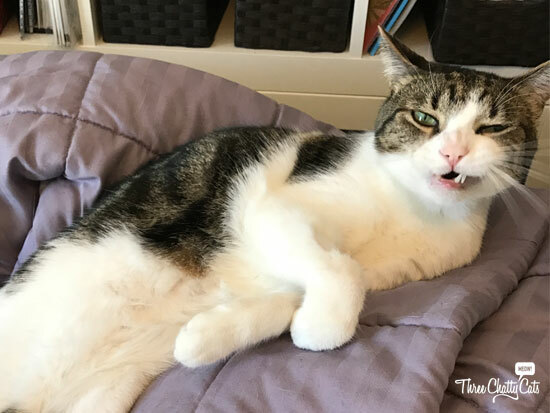 I try to clean my cat’s teeth regularly – but it’s quite a task! Hope your three are doing well.